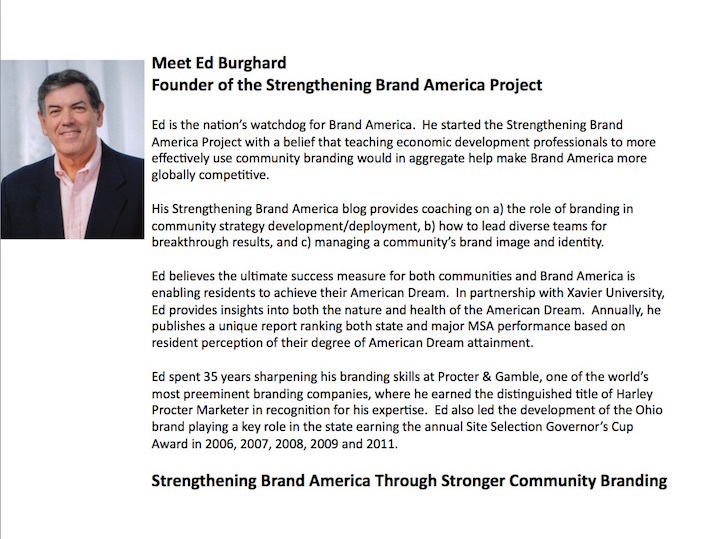 The Burghard Group LLC mission is to dramatically improve the level of place brand mastery in the U.S. by teaching economic development professionals how to reapply proven product and corporate branding principles. Success looks like more residents achieving more of their American Dream. As well as an increased share of global capital investment. Achieving both will stimulate accelerated job growth and economic recovery. The underlying assumption is that stronger community brands in aggregate create a strengthened Brand America. The Burghard Group Promise – Guided application of branding principles will help your location better enable residents to achieve their American Dream. In doing so, your location will be more globally and regionally competitive for top talent and job growth, retention and expansion. As a result, you will compete for more and win more site selection opportunities. Economic Development Professionals interested in learning how to leverage place branding as a way to increase foreign capital attraction, retention and expansion in their location. Project Goal – Provide practical place branding mastery information to help enable better strategic planning and execution. College and University Students interested in economic development. Project Goal – Provide an education resource to explain the important role of place branding in economic development and encourage active pursuit of a career. Academic Thought Leaders with a focus on economic development. Project Goal – Provide a forum for sharing thoughtful papers, opinions, and presentations on the important role of a strong Brand America. Branding Experts with an interest in place branding. Project Goal – Provide a venue to share thoughts on reapplication of private sector product and corporate branding principles in place branding, including case studies of successful tactics. Capital Investors interested in learning more about the U.S. as a location for their business operation. Project Goal – Provide helpful resource and contact information to facilitate an efficient evaluation process. Elected Officials interested in preserving the American Dream.